Serpentinite-hosted hydrothermal systems have been suggested as likely sites for the formation of organic compounds in the abiotic conditions of early Earth, that is, in the absence of living organisms. "Such compounds were likely crucial for the chemical evolution of life," explain Konomi Suda and colleagues at Tokyo Institute of Technology, Japan Agency of Marine-Earth Science and Technology and the Open University of Japan. Their latest research identifies mechanisms in the abiotic formation of the organic compound methane in serpentinite-hosted hydrothermal systems, a process that so far has not been satisfactorily understood. They conclude, "Based on a comparison of the hydrogen isotope systematics of our results with those of other serpentinite-hosted hydrothermal systems, we suggest that abiotic CH4 production directly from H2O (without mediation by H2) may be more common in serpentinite-hosted systems." Organic compounds are carbon based chemicals. The simplest organic compounds are strings of carbon atoms bonded to hydrogen. These hydrogen bonds can substitute with other atoms and molecules to provide the wide ranging organic chemicals that are found in living organisms. Methane is the simplest organic compound comprising just one carbon atom bonded to four hydrogens. In the absence of living organisms methane synthesis can occur through abiotic mechanisms, which likely played a significant role in the early Earth environment. Possible abiotic mechanisms include the formation of methane directly from H2O or H2. The formation mechanism and conditions such as temperature and pH determine the relative levels of different isotopes. The researchers compared water samples from five hot springs in the Shiroumadake area in Japan. One of these sites is Hakuba Happo, a newly discovered serpentinite-hosted system. Serpentinite is a rock that results from the geochemical processes of hydration and metamorphic transformation of ultramafic rock from the Earth's mantle. The water at Hakuba Happo is pumped up from two drilling wells Happo #1 and Happo #3. It is one of the most alkaline hot springs in Japan and the concentration of CH4 was 10-100 times that of the other hot springs. Different chemical isotopes that differ by the number of neutrons in the atomic nuclei form the same chemical compounds. For example both hydrogen (no neutrons in the nucleus) and deuterium (one neutron in the nucleus) can form molecular hydrogen (H2), water (H2O) and methane (CH4). Processes described as 'fractionation' affect the relative abundance of different isotopes in the chemical compounds in a given system. Fractionation equilibrium describes the system when the abundance of isotopes in the different chemicals no longer changes with time. Comparing known fractionation equilibrium values with the measured isotopic abundance provides clues of processes that have taken place in the system. More information: Konomi Sudaa, Yuichiro Uenoa, Motoko Yoshizakia, et al. 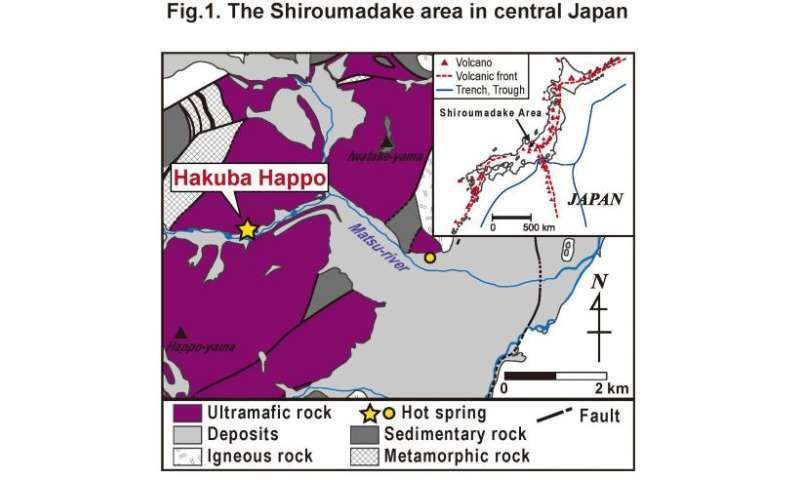 "Origin of methane in serpentinite-hosted hydrothermal systems: The CH4–H2–H2O hydrogen isotope systematics of the Hakuba Happo hot spring" Earth and Planetary Science Letters, 2014, 386 112-125.